In 2012, Denver Broncos outside linebacker Von Miller recorded 68 tackles (including 28 for losses), six forced fumbles and 20 sacks (if given full credit for half-sacks). Playing 915 snaps, Miller only missed two tackles all year, according to ProFootballFocus.com. 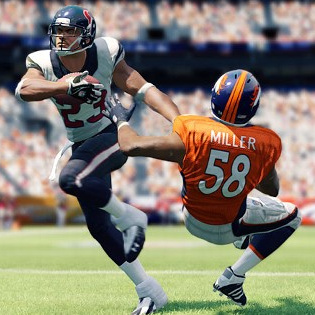 On Tuesday, EA Sports released the first game play image for Madden NFL 25, which is expected to be released in August. The image, seen to the right, shows Miller missing a tackle against Houston Texans running back Arian Foster. Miller has been in the league for just two seasons and is already regarded as one of the top defenders in the game, averaging 15 sacks a season and missing only two tackles in 31 career starts. So why choose him, EA? Last year, EA Sports released four images of Broncos defenders missing tackles leading up to the summer release of Madden NFL 13. Now Miller is displayed missing a tackle—a coincidence? EA's headquarters is based in Redwood, California, just 41 minutes away from Oakland—perhaps the developers are Raider fans? All conspiracy theories aside, Miller is the last player that should be shown missing a tackle (he has a 95 tackling rating in the game). Miller is entering 2013 seeking his third consecutive Pro Bowl selection. But in EA's popular football video game, he hasn't gotten tackling down just yet. Well, that makes sense, right?